Use the below links tabs to view material covered each day. It is your responsibility to review this material extensively after each class. By now most students have realized that you cannot simply come to class and take the tests. Extensive study is necessary and will be absolutely necessary prior to taking the AP Environmental Science Exam later in the year. Please develop beneficial study habits as the year progresses, so that you have the necessary study habits to perform well in college. This unit has many intraconnections within the chapter and many interconnections with material from other chapters, so it is a great unit to start developing good study habit with if you have not already. As usual, please be sure to have your objectives complete prior to the chapter exam. No late work will be accepted. Please see this document if you lost your hard-copy of the objectives or prefer a digital copy. These files will be used throughout the unit. Know El Niño well - scour the web, watch youtube videos, read your textbook, take notes, make the connections! Global Climate Change Evidence (document here) - not necessary, but helpful. 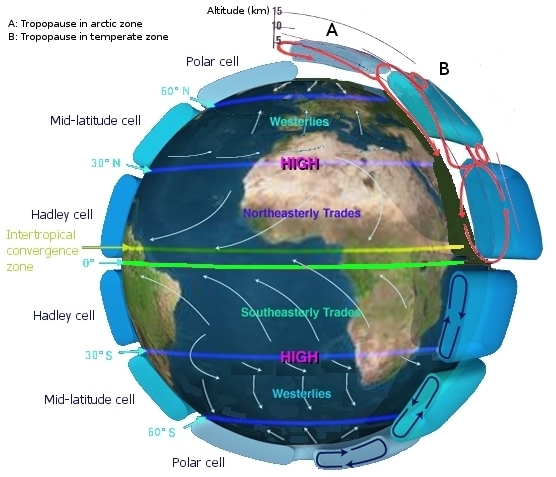 Challenge Question - How do the properties of air and the Coriolis Effect determine how convection currents cause the development of global wind patterns? How do these global wind patterns affect ocean currents (gyres) and contribute to ENSO? How do these air and water current interactions contribute to climate change? Concept map connection between all climate change concepts.